For centuries hedges have been a feature of homes and large estates. They can be great privacy screens, garden features, borders, and even mazes (think Ashcombe Maze on the Mornington Peninsula!). What turns a row of plants into a hedge is its regular pruning. When done well, hedge trimming results in thicker foliage and healthier plants. Hedges thrive in Melbourne’s climate, and our Kingfisher Tree Services team are our city’s hedge trimming specialists. We have the experience and correct equipment (including a brush cutter hedge trimmer) to ensure your hedge is trimmed in a way that promotes it’s thickness, shape, and overall health. Why is Hedge Pruning Necessary? Naturally, the main objective of hedge pruning is shaping, but in the pruning process, we will also remove dead branches and any foliage that is being affected by diseases or is harbouring pests. It is best to begin pruning your hedge to shape while the plants are very young so that as they mature they will grow in density as they take the desired shape. Many Melbourne residents and those living on small acreages are opting to plant hedges instead of fences, or along existing fences, because of the improved aesthetics they provide. While it is tempting to let your hedge plants take on initial height growth for privacy reasons, we encourage you to start your hedge trimming early to boost the plant’s thickness. When you do so, they will eventually provide better privacy and just look so much better. At Kingfisher Tree Services we love hedges, and our hedge trimmer reviews tell us that we get these jobs just right. Our arborists have the knowledge, skills, and experience to ensure the correct maintenance of your hedges. We will remind you when it is time for a prune, to ensure your hedge doesn’t get out of control. Hedge trimming is very concise work that requires expert hands and eyes. One mistake when trimming a hedge can make everything seem out of place. 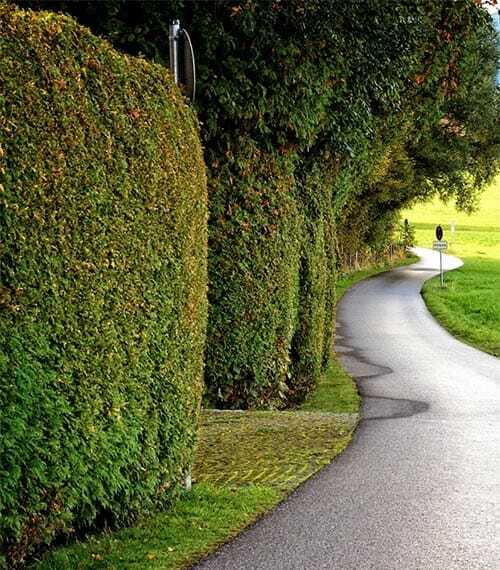 We are experts at this type of trimming and look forward to making your hedges look perfect! We are comprehensively insured and always focus on safety as we work – giving you peace of mind that you are in the hands of true professionals. Call us today on 0458 733 489 or email your enquiry to info@kingfishertrees.com.au.